Flat Rate $5.95 Shipping applies to orders delivered within the Contiguous 48 States regardless of size or weight. Flat rate shipping also applies to many orders shipping to Hawaii, Alaska, US Territories and APO/FPO locations, with some exceptions (Please see below). Orders will ship via USPS (US Postal Service Priority Mail, First Class Mail or Parcel Select), UPS (Ground or SurePost), or FedEx (Ground/Home Delivery). 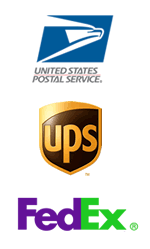 The service used to ship your package will be determined by a number of factors such as weight and shipping location. Generally, very small, light items will ship via USPS, while larger, heavier orders will ship via UPS or FedEx. All orders will receive a tracking number that will be sent to your registered email address at the time of shipment. Most of our orders ship within 48 business hours (Monday - Friday), with many shipping the same day they are placed. The time your order takes to ship is also dependent upon the the availability of product ordered and the accuracy of the billing and shipping information you provide. Currently, most of our orders are shipped out of our Pennsylvania location using USPS, UPS, or FedEx services. Standard delivery times may vary but are usually between 1-7 business days (not including processing and handling time). The delivery time of your order is largely based on your location, and some orders may take longer due to possible shipping carrier delays which are out of our control. WE SUPPORT OUR TROOPS! The large majority of orders shipped to APO or FPO addresses (AA, AE, or AP) will ship for the flat rate fee of $5.95. These orders will ship via USPS Priority Mail. Please note that Shipping Insurance is not available for APO / FPO deliveries and because of this NutritionArsenal.com is not responsible for any damages or lost packages on these orders due to the extreme conditions which they must sometimes endure during shipment. Additional shipping charges may apply to some orders with heavier weights when the actual cost of shipping is very high. We will notify you in these instances. When indicating your shipping address, "APO" or "FPO" will be your "City," "AA," "AE," or "AP" will be your "State," and your ZIP Code will begin with either 09, 34, or 96. Leave the "Country" as "United States." We do ship to P.O. Boxes via USPS and UPS SurePost. Please note that some orders with heavier shipping weights may not be able to ship to P.O. Boxes. In these cases, we will notify you to arrange for the order to be shipped to an alternate address.